Even two prominent global data sources appear to disagree, at least on the surface. “World deforestation slows down ” was the headline of the 2015 Global Forest Resources Assessment  (FRA) published by the United Nations Food and Agriculture Organization (FAO). In the same year, Global Forest Watch  reported that “global annual tree cover loss remains high .” What gives? Unfortunately, the answer is not simple. 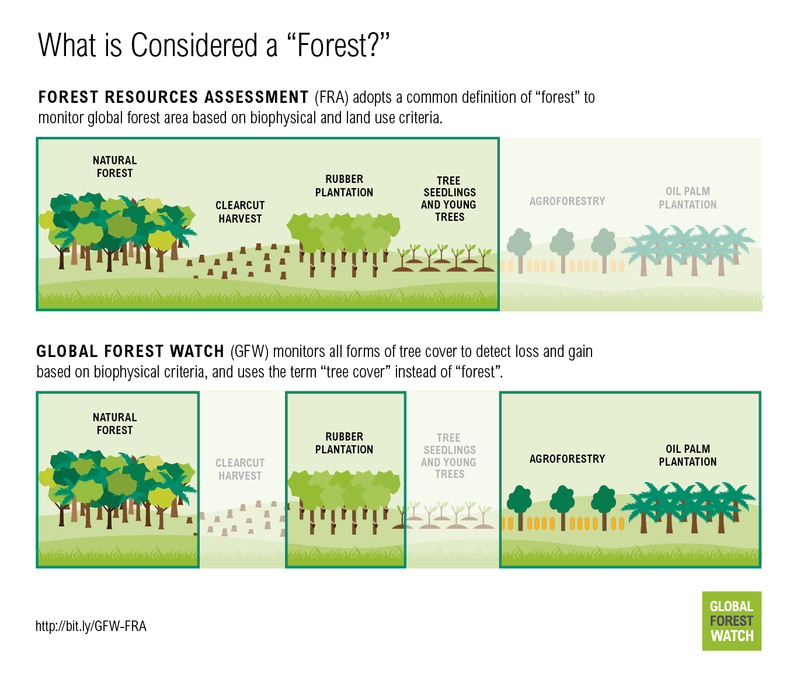 Both GFW and FRA provide valuable information on the state of global forests, but they differ substantially in terms of purpose, scope and approach. By answering questions on how and why these two global data sources differ, we can begin to see them as complementary rather than contradictory. Ultimately, our knowledge of global forests remains incomplete, and we need all the information we can get. 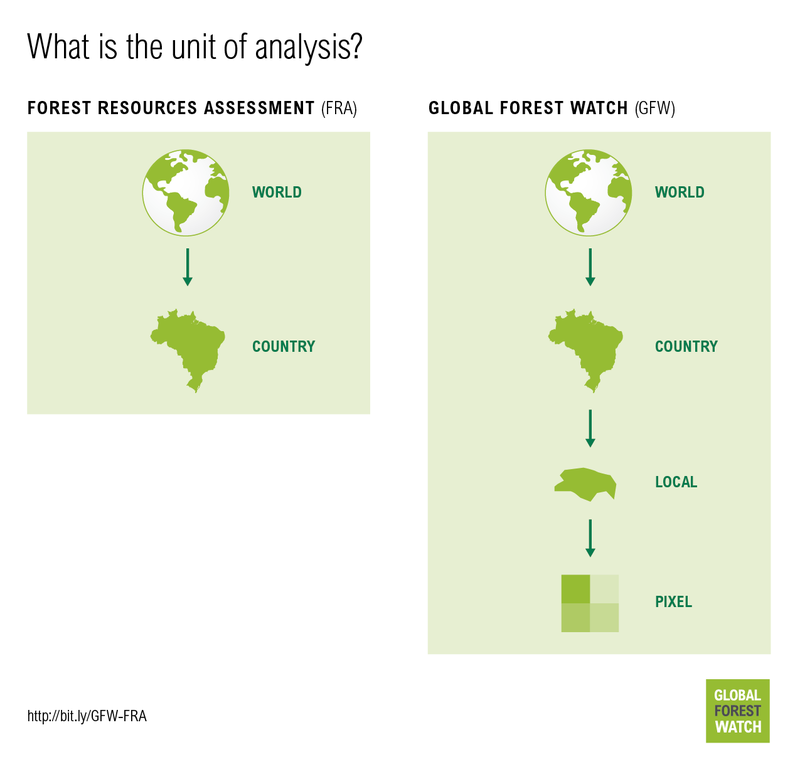 What Are Global Forest Watch (GFW) and the Global Forest Resources Assessment (FRA)? GFW is an independent online forest monitoring platform launched in 2014 by a consortium of partners led by the World Resources Institute. GFW seeks to empower forest managers, law enforcement officers and other forest stakeholders with free access to timely and high resolution data about the current status of forests and recent forest change. GFW uses satellite technology to monitor tree cover loss worldwide with weekly and annual updates. The FRA, which the FAO has published at five- to 10-year intervals since 1946, seeks to provide a consistent and comprehensive approach to describing the world’s forests and how they are changing. The most recent 2015 edition of the FRA included national-level statistics on more than 100 ecological and socio-economic variables reported by 234 countries and territories. What is considered a “forest”? 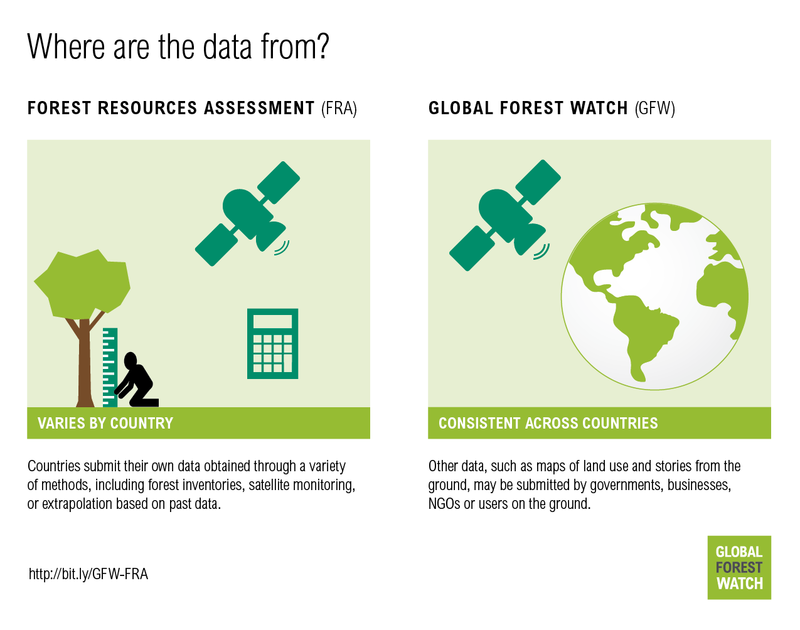 GFW and FRA both talk about “forests,” but what are they actually measuring and monitoring? There are more than 800 definitions  of "forest" in use, which only adds to the confusion. Every five years, the FRA publishes a statistic on the total area of forest land worldwide. Based on past assessments, it also indicates whether global forest area is increasing or decreasing over time. These area measurements are based on a standardized definition  of “forest” adopted by the FAO in 2000, which takes into account biophysical and land use criteria. The biophysical criterion establishes minimum thresholds for the height, canopy cover and extent of trees. The land use criterion requires that land be officially or legally designated for a “forest use,” such as conservation or harvest. Land that contains trees but is designated for agricultural or urban uses – for example, an oil palm plantation or a city park – would not be considered a forest. On the other hand, land that is temporarily devoid of trees – for example, recently logged or burned areas – would still be classified as forest if the official land use stipulates that trees will be allowed to regenerate in the future. GFW monitors tree cover change in near-real-time using satellites, which cannot discern intended land use. Thus, GFW’s monitoring systems rely entirely on biophysical criteria (height, canopy cover and extent of trees). GFW does not adopt a specific definition of forest, but rather monitors all forms of tree cover including natural forests and tree plantations. Similarly, GFW detects and reports all instances of tree cover loss, regardless of whether the loss will be temporary (e.g. clear cut harvest followed by replanting) or permanent (e.g. clear cut harvest followed by agriculture). Using GFW’s interactive online platform, users can filter these data based on their preferred definition of forest. 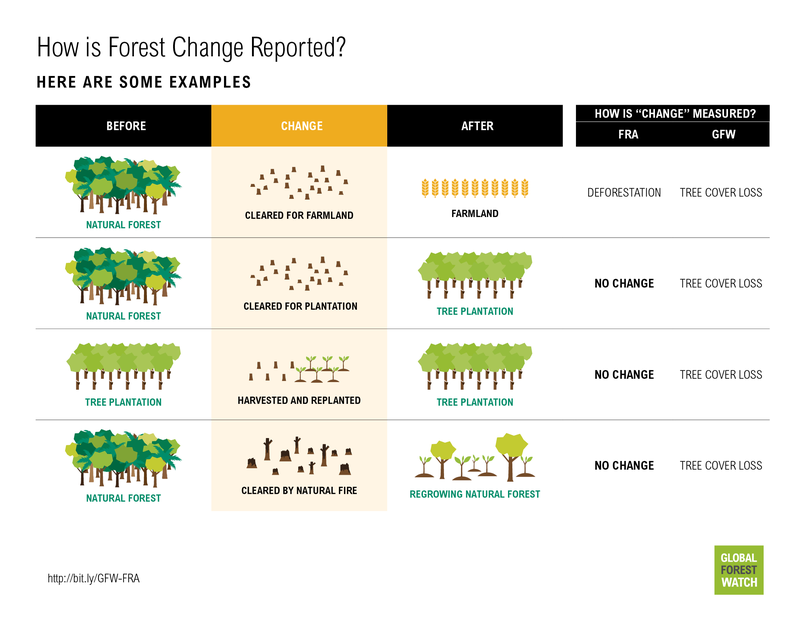 How is “forest change” reported? GFW and FRA apply different lenses to monitor forests, which subsequently influence how both forest change and deforestation are reported. Using its land use criterion, the FAO’s definition of deforestation requires permanent land use change to occur. Losses of tree cover considered to be temporary (e.g. forests that have been clear cut but will be left to regrow) are not counted as deforestation. On the other hand, GFW detects and reports all instances of tree cover loss, regardless of whether the loss will be temporary or permanent. As above, GFW does not seek to define deforestation but rather allows users to filter tree cover loss data based on their own preferred definition. Beyond definitional issues, FRA and GFW differ in how they aggregate monitoring data into global statistics about forest change. FRA reports net change in forest area, which takes into account both forest loss and gain. Thus, zero change in forest area may be reported in the FRA if deforestation in one region was compensated by expansion of planted or natural forests in another region. GFW reports gross loss and gross gain of tree cover as separate statistics. Since loss is updated on a much more frequent timeframe than gain (due to the very gradual nature of tree growth compared to the immediate nature of tree clearance), GFW does not recommend aggregating loss and gain to calculate net change. The FRA compiles official government statistics on forest-related information. These data are self-reported by countries and can come from a variety of sources using a variety of methods, including national forest inventories, academic studies, government registries or district forest offices. Although the FAO provides guidelines on what and how to report, in reality many countries employ their own definitions and methods. GFW features satellite-based data, providing an independent, transparent and globally consistent record of Earth’s land surface and how it is changing. This record enables consistent comparisons across countries and over time. Some countries update their forest inventories frequently, while others update them only every 10-20 years. In the 2015 FRA, 87 countries included forest area figures that were 10 years old or more. When country reports are unavailable, the FAO fills in gaps using available literature and expert estimates. Developed countries, such as the United States and Canada, generally update their forest area estimates more frequently than tropical developing countries. This leads to a reporting disparity between temperate/boreal forests and tropical forests, which is where the majority of deforestation is occurring. GFW’s “tree cover loss” is based on available satellite data and is measured largely in the same way every year and across all countries. The FRA collects statistics at the national scale, which are aggregated to provide insights about forest change dynamics regionally and globally. Satellite-based data on GFW records changes in forest area by dividing Earth’s land surface into pixels. These pixels can then be aggregated to show changes over larger areas of interest. This modular format means that in addition to understanding forest dynamics at global, regional and national scales (as with FRA), users can also monitor changes within custom areas of interest, such as a specific national park in their country, a provincial district, an indigenous territory or even their own backyards. How one defines forest and deforestation is at the heart of the confusion and controversies surrounding these two data sources. Critics of FRA claim that FAO’s “net forest change” statistic provides an overly optimistic view of global forest trends, since loss of natural forests, rich in biodiversity and carbon, can be offset by expansion of tree plantation monocultures. Meanwhile, critics of GFW claim that satellite-based monitoring of “tree cover loss” creates an overly pessimistic view, since these data lump together permanent and temporary loss of tree cover within natural forests and tree plantations and do not take into account tree cover gain. In the end, transparency of methods and data will be critical to help people make sense of best available information. The differences between GFW and FRA reveal strengths and shortcomings of both sources, which make them appropriate for different applications. Bottom-up approaches like the FRA benefit from locally appropriate customization of data, whereas global monitoring systems like GFW offer more consistency across geographies and through time for making comparisons. The FRA is more comprehensive in scope, but GFW offers more frequent and spatially precise updates. The accuracy of GFW’s satellite-based monitoring systems is often criticized based on fundamental limitations in what can be observed from satellites, while the accuracy of FAO’s country-reported data is often criticized for being outdated, incomplete or based on non-transparent methods. Ultimately, neither GFW nor FRA is perfect or complete, meaning that we will need to rely on both sources to understand what is happening in the world’s forests.